Remember that Target commercial last year that poked fun at home made Halloween costumes? Some people, including me, were not too fond of the message they were sending. This year at New York Comic Con the GeekDads and GeekMoms hosted a discussion panel and my topic was 5 reasons you should build your kid’s costume. Here are the reasons I presented to a packed room of Comic-Con style parents. Reason 5: Making something with your kids sends a positive message. When you make something practical with your kids you are helping them become self-sufficient. Consumerism is the norm for kids these days. I want my children to realize they are not reliant on commercial products for everything; that’s why it is important to let the kids participate in some aspect of the build process. This activity will help foster creativity, teach problem solving, and is a chance to teach the lessons of reuse, recycle, and remake. Reason 4: You can integrate safety into the costume. Safety is important: trick or treating involves walking around in areas that mat not be well lit. That’s why you want your kids to have some kind of reflective or illuminating aspect to the costume so they are visible to drivers. Nothing ruins a cool costume faster than hanging an bike reflector around a kids neck or worse, an orange vest. Instead try adding LEDs to the costume or EL wire or some luminescent paint. They can be used to light up buttons on a robot, illuminate a weapon or give a ghost an eerie glow. 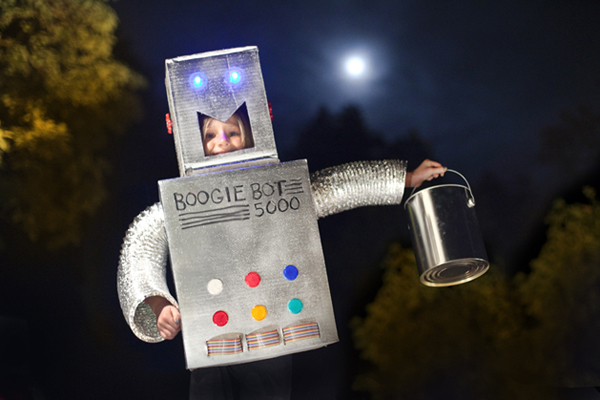 The Boogie Bot 5000 pictured above uses blue LEDs for the eyes. Check out the instructions over at Craftzine.com. Unless your kid is going as my uncle doing his court-ordered community service, leave the orange vest home. Reason 3: You’ll be able to find other Geeks in the neighborhood. When you make your kid’s costume they can go as the characters commercial costumes don’t cover. That’s when you can find out who the real geeks in the neighborhood are. Sure most people will say “How cute” and give the kid some candy, but there will be that one guy who says “Nice Boromir costume … wait, let me get my Horn of Gondor !” He’s one of ours — invite him to your next D&D night. Reason 2: You can educate the non-geeks in the neighborhood. Just because the neighbors aren’t geeks does not mean you can’t spread the geek knowledge. Take a moment and explain to the nice lady with the Reese’s Peanut Butter Cups that the the “curvy sword thing” is called a bat’leth and it is a traditional Klingon weapon. Who knows, next year she may come to the door as one of the Duras sisters and give out gummi Gagh. And the number one reason you should make your kids costume for Halloween is: Those pictures will be embarrassment gold when they are teenagers! The teenage years. Embarrassment awaits them behind every corner so why not break out those pictures of your daughter dressed as a Dalek or the twins as Ewoks? Spending time with your kids, teaching them valuable lessons and making great memories. You can’t buy that anywhere … but you can make it.